As far as court battles go, 2017 was a busy year on the voting rights front in Texas — and 2018 will likely be no different. After years of litigation, Texas and its legal foes — minority and civil rights groups and voters of color — begin the year waiting on the courts to rule on the fate of the state’s embattled political maps and voter identification requirements. Federal judges are also expected to have the final word on whether lawmakers intentionally discriminated against Texans of color in drawing up both measures. There’s no saying whether the cases will be resolved in 2018. But as the sides await a final resolution years after the measures were first enacted, the attention will ultimately fall on whether Texas will be placed back under federal oversight of its election laws. Texas and the minority rights groups suing over the state’s congressional and House districts maps are waiting to hear whether the U.S. Supreme Court will take up the state’s appeal of a lower court ruling that invalidated parts of the state’s political maps where lawmakers were found to have discriminated against voters of color. The holding pattern at the Supreme Court could end as soon as this month. The high court on Friday will meet to consider whether it will review the case. There’s no way of knowing if the court will immediately announce a decision regarding the case, but several outcomes are possible. As part of a complicated, years-long legal fight over the state’s political lines, a three-judge panel in San Antonio ruled last year that the state’s congressional and state House maps need to be redrawn to address voting rights violations. Specifically, the judges flagged two congressional districts and nine House districts in four counties. Adjusting boundaries in those districts could lead to a wider reconfiguration of the map because neighboring districts may also be affected. In the best case scenario for the state, the Supreme Court could take up the case and schedule oral arguments. That would further stall efforts to redraw the state’s map this year. The high court could also dismiss the state’s appeal or affirm the lower court’s ruling — an ideal outcome for those challenging the maps because it could allow the parties to return to court in San Antonio to hash out new maps. The state’s current maps — adopted by the Legislature after judges in 2012 tweaked boundaries drawn following the 2010 U.S. census — have been used during the past three election cycles. The longer the Supreme Court takes to act in the case, the less likely it becomes that revised districts could be put in place this year. Even if the court worked quickly and sided with the plaintiffs in the case, revised maps drawn in court could also be appealed. The state’s lawyers have also noted that Gov. Greg Abbott has the power to call lawmakers back to Austin for a special legislative session to redraw the maps if the Supreme Court ultimately determined they violated the law. The redistricting case and the possible outcomes are convoluted, to say the least. 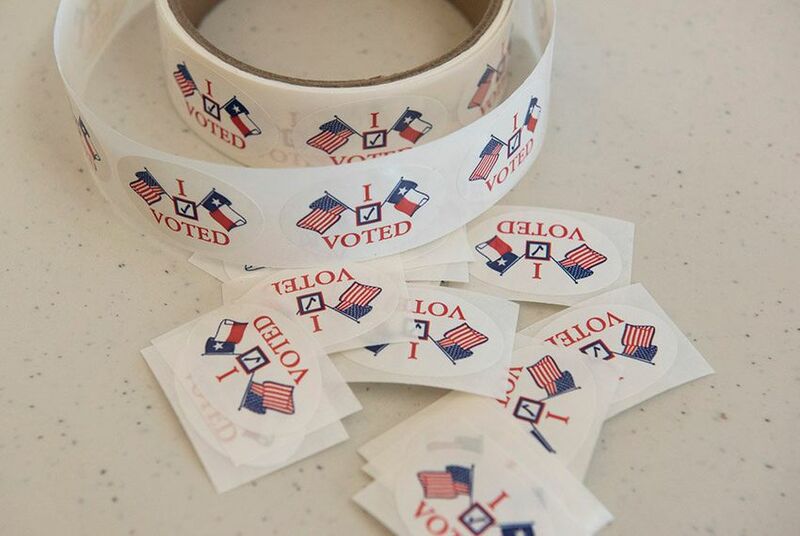 Texans are set to return to the polls in March for the primary election. The years-long battle over Texas’ voter identification law, which first passed in 2011 and restricts the forms of identifications accepted at the polls, will also extend into 2018. A revised version of the law went into effect this week, but the litigation is far from over. Texas and opponents of the law — voting and civil rights groups and individual voters of color — most recently clashed before a three-judge panel of the U.S. 5th Circuit Court of Appeals in December over the law and state lawmakers’ attempts to soften it amid voting rights violations identified by federal courts. The 5th Circuit has already agreed that the law disproportionately burdened voters of color, who are less likely to have one of the seven forms of identification the state required them to show at the polls. It also ruled that the law violated federal safeguards against racial discrimination in elections. Now, it’ll be up to the three-judge panel to decide whether lawmakers did so on purpose — as U.S. District Judge Nelva Gonzales Ramos found in two rulings last year — and what the state’s revisions to the law in 2017 mean for the long-winding case. It’s unclear when the appellate panel will rule in the case, and regardless of the outcome, that ruling will almost certainly be appealed to the full 5th Circuit or to the U.S. Supreme Court. As things stand today, Texans looking to cast votes in this year’s elections will have to comport with the state’s revised rules. The list of permissible IDs was unchanged under the state’s new ID law: a state driver's license or ID card, a concealed handgun license, a U.S. passport, a military ID card, a U.S. citizenship certificate or an election identification certificate. But the new law allows Texans without photo ID to vote if they present alternate forms of ID — utility bills, bank statements or paychecks — and sign affidavits swearing a “reasonable impediment” kept them from obtaining the proper ID. Those found to have lied about not possessing the proper photo ID could be charged with a state jail felony, which carries a penalty of 180 days to two years in jail. Opponents of the law asked the court late last year to reconsider a previous ruling that gave Texas the OK to use the new voter ID law in 2018. It's unclear when the court will respond, but both sides are facing a crucial deadline: Early voting for the primary election begins Feb. 20. A return to federal supervision? Looming over both cases is the possibility that federal judges could invoke a section of the Voting Rights Act that would place Texas back under federal supervision when it comes to changes to election laws — a process called preclearance. For decades, Texas was a on a list of states and localities that needed federal permission to change their election laws, a safeguard for minority voting rights. The U.S. Supreme Court wiped the list clean in 2013, but left open the possibility that states could return to the list if they intentionally discriminated in the future. The barrage of court rulings against the state has forced Texas leaders to confront whether they strayed too far in enacting voting laws found to have disproportionately burdened voters of color. So far, courts across the country have fallen short of placing other states back under preclearance amid voting rights violations.